Only your doctor can order PAP therapy. This PAP prescription will include the appropriate pressure or range of pressures and the length of time PAP therapy is to be used. There are guidelines to initiating PAP and documenting compliance. Initiating PAP is similar to any other prescribed therapy and should be initiated by a professional and undergo periodic assessment of symptoms and PAP compliance. Proper fitting of the mask, headgear or other interface is key to assuring the best chance for success. The Durable Medical Equipment Company (DME) that you select or that is assigned to you by your physician or insurance company should be easily accessible and make you feel comfortable calling if there are any adjustments to be made. PAP therapy does not work well sitting in the closet. There are guidelines to PAP therapy that have become a conventional standard to follow. Insurance companies will vary on set up of PAP and what is entailed in follow up as well as compliance by the patient. These guidelines should be thoroughly explained to you before initiating therapy. To initiate therapy patient must have the following: a "face to face" evaluation with their treating physician and the evaluation should include: signs and symptoms of OSA (sleep history), Epworth Sleepiness Scale, BMI, neck circumference and evaluation of cardiopulmonary and upper airway system. Documentation of face to face evaluation needs to be contained in patient's chart notes and forwarded to DME company with referral. After patient is set up on PAP equipment, patient must have a "re evaluation" with the treating physician no sooner than the 31st day but no later than the 90th day on service. Re-evaluation needs to include the following: documentation that the symptoms of OSA have improved and objective evidence of compliance to therapy (ie: download) which must be reviewed by the treating physician. Compliance is defined by Medicare for this policy as use of PAP device for at least 4 hours per night for 70% of the nights in a 30 consecutive day period during the first 90 days. If above criterion is not met, Medicare will not consider the PAP device "medically necessary" and will not cover the cost of the device. If patient does not meet criteria for coverage within the 90 day period, then in order for patient to "re-qualify" for PAP therapy, the patient must undergo another "face-to-face" clinical evaluation with the treating physician and attend another "facility-based" sleep test to assist in discerning the reasons for the initial failure. 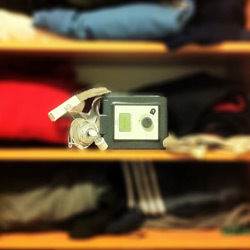 ICD-9 code 327.23 is now the only acceptable code for PAP devices for patients diagnosed with "obstructive sleep apnea." The first two week of PAP therapy are probably the most trying but also the most important. Acclimating to using PAP is not always easy and people may have problems falling asleep or keeping the mask on throughout the night. If you are uncomfortable wearing the mask then you are not alone. Acclimating to PAP takes some time and the beneficial effects of using PAP may not be immediate. Call your physician or DME to help you through this adjustment period. There is usually a compliance recorder in the PAP machine that records how often you use your machine and may even detect apneas. It is extremely important that you use your PAP or the insurance provider may ask you to return it.